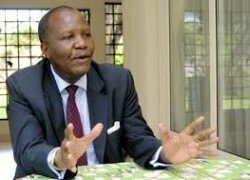 FINANCE Minister Felix Mutati says there is need to transform the civil service from a consumption-oriented entity to a productive one in order to overcome the challenges the country is facing and that there is need for everyone to sacrifice to achieve this goal. And Mr. Mutati said he will not relinquish his position as MMD president because his appointment to the ministry was purely to galvanize his expertise with others for the benefit of the country. Speaking soon after being sworn-in by President Edgar Lungu at State House yesterday, Mr. Mutati said there was need for Zambians to sacrifice in order to overcome the economic challenges that lay ahead, saying there will be need for collective use of the expertise needed to address the challenges. He said the pending International Monetary Fund (IMF) bailout plan was not the only option available to Zambia in its quest to stabilise the economy but urged Zambians to exercise endurance as the country moved toward economic emancipation, adding that he was confident that the country will overcome its challenges with hard work. “Going forward, we need to do three things particularly for the civil service; we need to transform it from a service that focuses on consumption to a productive civil service. There is need for the mental change; the mind-set change. Our collective wisdom when summoned, nothing is impossible, not even the economy will be able to do that and lastly, we must be able to sacrifice. “The journey is going to be painful and there will be need for endurance. The IMF is but just one option that we will have to deal with as we go forward and how we deal with that will depend on our collective wisdom, our collective talent. ‘‘I’m confident that Zambians will work and pull together to deal with whatever difficulties that lie ahead. Sacrifice calls for enduring up to the end in order to make progress,” Mr. Mutati said. Mr. Mutati thanked President Lungu for showing confidence in him by appointing him to a sensitive ministry which was at the epicentre of economic development, saying he had demonstrated the need for the unity of purpose in his quest to develop the country. “I am really humbled by the humility of the President to appoint me to a very challenging ministry, the ministry that is the heartbeat of the economy. The President has demonstrated once again his oneness, the ‘ubuntu spirit’. He has demonstrated that unity of purpose is the oxygen for progress and development and that national duty is more important than individual affiliations that we have,” he said.And Mr. Mutati said he will not relinquish his position as MMD president because his appointment to President Lungu’s Cabinet was purely to use his expertise for the benefit of the country. “I will remain president of the party; I am here to serve the nation, to add my capabilities with others to solve the critical issues. With President Lungu, we discussed that matter and agreed that I will not abdicate my presidency,” he said.